VMware Workstation 7.1 is here! •OpenGL 2.1 support for Windows 7 and Windows Vista guests — Improves the ability to run graphics-based applications in virtual machines. •Improved Graphics Performance — Enhanced performance with better benchmarks, frame rates, and improved rendering on Windows 7 and Windows Vista guests allows you to run various graphics-based applications. In addition, major improvements in video playback enable you to play high-resolution videos in virtual machines. •Automatic Software Updates — Download and install VMware Tools and receive maintenance updates when available. •Direct Launch — Drag guest applications from the Unity start menu directly onto the host desktop. Double-click the shortcut to open the guest application. The shortcut remains on the desktop after you exit Unity and close VMware Workstation. •Autologon — Save your login credentials and bypass the login dialog box when you power on a Windows guest. Use this feature if you restart the guest frequently and want to avoid entering your login credentials. You can enable Autologon and use direct launch to open guest applications from the host. •OVF 1.1 Support — Import or export virtual machines and vApps to upload them to VMware vSphere or VMware vCloud. The VMware OVF Tool is a command-line utility bundled in the VMware Workstation installer. Use this tool along with VMware Workstation to convert VMware .vmx files to .ovf format or vice versa. VMware recommends that you use the OVF command-line utility. For more information, see the OVF Web site and OVF Tool User Guide. •Eight-Way SMP Support — Create and run virtual machines with a total of up to eight-processor cores. •2TB Virtual Disk Support — Maximum virtual disks and raw disks size increased from 950GB to 2TB. •Encryption Enhancements — VMware Workstation includes support for Intel’s Advanced Encryption Standard instruction set (AES-NI) to improve performance while encrypting and decrypting virtual machines and faster run-time access to encrypted virtual machines on new processors. •Memory Management — User interface enhancements have simplified the handling of increased virtual memory capacity. •User Experience Improvement Program — Help VMware improve future versions of the product by participating in the User Experience Improvement Program. My copy of Workstation 7.1 is downloading now. I have been using workstation since the original alpha and beta of “VMware” and can’t wait to get this latest version of installed! 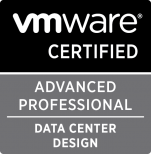 VMware Education has announced their new VMware Certified Advanced Professional (VCAP) Certification specialties VCAP4-Datacenter Administrator (VCAP4-DCA) and VCAP4-Datacenter Design (VCAP4-DCD). The VCAP-DCA is directed toward System Administrators, Senior Consultants and Technical Support Engineers who work with large and more complex virtualized environments and can demonstrate technical leadership with vSphere technologies. Successful candidates are able to use automation tools, to plan and design virtualized solutions and to administer all vSphere Enterprise components. Registration opens July 12. Learn more about this VCAP specialty. The VCAP-DCD is directed toward IT Architects and Consulting Architects who design VMware solutions in a multi-site, large enterprise environment. They have a deep understanding both of VMware core components and their relation to storage and networking as well as datacenter design methodologies. They also possess knowledge of applications and physical infrastructure, as well as their relationship to the virtual infrastructure. Registration opens in August. Learn more about this VCAP specialty. VMware has designed several courses to help VCPs ramp their skills in preparation for VCAP certification exams. I have participated in “Train the Trainer” versions of each of the three courses listed above and heartily recommend them. Even if you do not anticipate pursuing advanced certification, these courses will greatly enhance your virtualization skills. If you later decide to pursue the advanced VMware credentials, you will be well on your way. These new specialties follow on after the VMware Certified Professional 4 (VCP4) exam and define the prerequisites along the path to VMware Certified Design Expert 4 (VCDX4) VMware premier certification. For more information on the VCDX4 Certification follow this link.